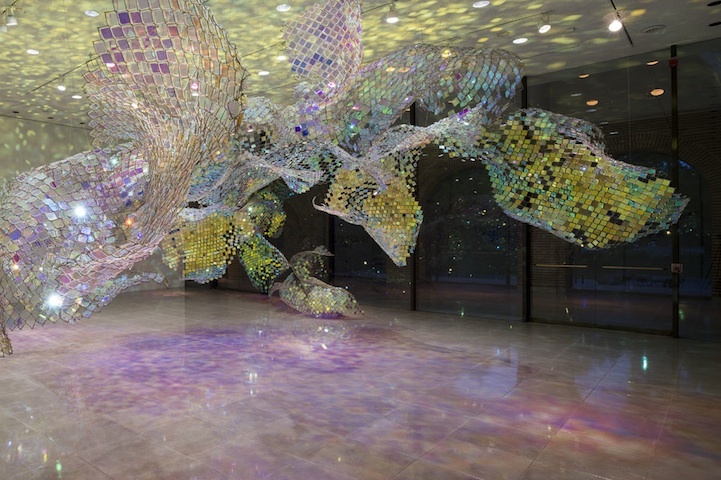 When we first came across American artist Soo Sunny Park's gorgeous sculpture, called Capturing Resonance, we were blown away by two facts. One, that it was made by chain link fencing and Plexiglas, and two, that all the different colors emanating from it were the result of light being reflected and refracted off the Plexiglas squares. As she told us then, "There are no colored plexi used in the work. It is an optical illusion, depending on the intensity of light hitting the plexi and the viewer's viewing angle, each plexi piece bounces color differently."